Born in Barcelona, coloratura lyric soprano Victoria de los Ángeles López García (1923-2005) was the daughter of the conservatory caretaker, and surrounded by music from her earliest days. Exceptionally talented, she graduated from the Barcelona Conservatory in three years instead of the usual six. She loved French, German Lieder and especially Spanish and Catalan art songs as much the opera repertoire. In 1944, she made her public début in a song recital at the Palau de la Música Catalana; three years later, she won first prize at an international singing competition in Geneva, and was immediately invited to audition at La Scala in Milan: only she declined, saying her parents expected her back at home. But in the single season of 1950-1951 she would do something no other singer had done, making her débuts at Covent Garden as Mimi, at La Scala in the title-role of Ariadne auf Naxos, and at New York's Metropolitan Opera, New York, as Marguerite in Gounod's Faust. To many of her fans' surprise, she retired from opera relatively early to concentrate on recitals, where she played herself. 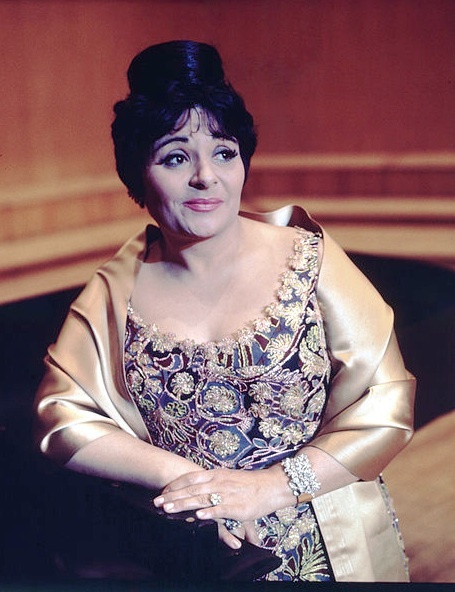 She had a gift, however, for breaking down all the formality of the concert hall, and introduced many audiences to Spanish and Catalan songs, which some critics say she sang best of all. One of her last public performances was at the closing ceremony of the 1992 summer Olympics, at age 68, when she sand the Catalan song popularized by cellist Pau Casals, El cant dels ocells as the Olympic torch slowly went out.